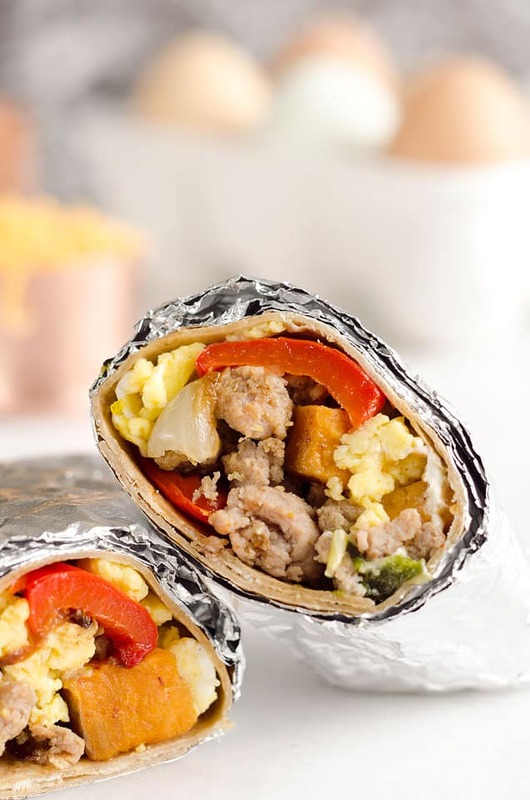 Light & Spicy Turkey Sausage Breakfast Burritos are a healthy freezer-friendly breakfast full of lean Jennie-O turkey sausage, scrambled eggs and roasted vegetables. 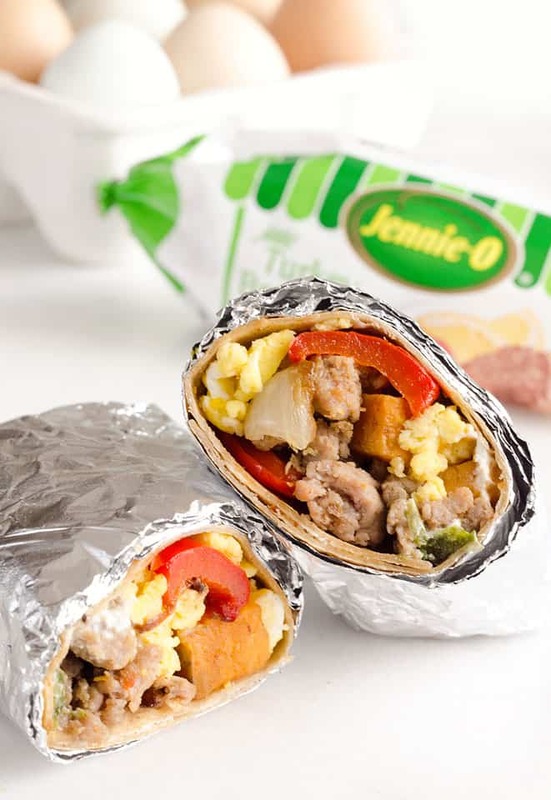 Grab one from the freezer for a quick protein packed meal on the go or sit down with it to enjoy a hearty breakfast. Does anyone else struggle with the breakfast routine besides me? I find myself getting in a rut and making the same thing over and over or I don’t allow enough time in the mornings to grab any sort of nutritional meal before heading off to work. Whether it is an English Muffin with peanut butter or cereal and milk, most breakfast options are so high in carbs that it is hard to get a protein-packed and healthy breakfast in. 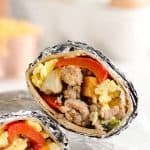 That is why I decided to finally get ahead of the game and stock my freezer full of these easy make-ahead breakfast burritos featuring Jennie-O turkey sausage. I sauteed up a pound of lean turkey sausage with some jalapeño for a kick, scrambled some eggs with plenty of milk and roasted some of my favorite vegetables. I piled it all in a whole grain tortilla and finished it off with a little bit of cheese and Greek yogurt. All of the burritos then got neatly wrapped and packed up for a trip to the freezer. 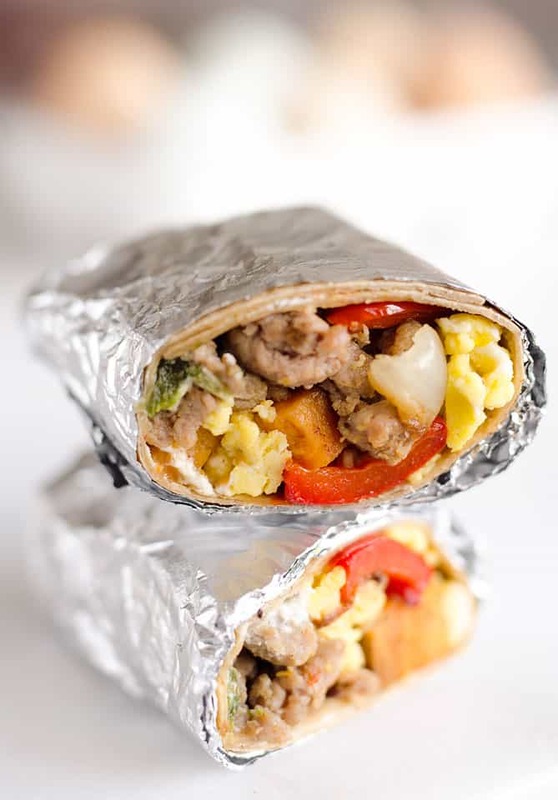 In a matter of less than an hour, I had 10 breakfast burritos ready and waiting in my freezer for those times when I am craving something hearty and healthy for the most important meal of the day. When I only have a few minutes to prepare a last minute breakfast but want something more substantial than a granola bar and piece of fruit, I grab one of these bad boys from the freezer and pop it in the microwave. If I have more time on my hands I will throw it in a non-stick skillet for a toasty and crunchy outside shell or I pop them in the oven if I am feeding a crowd. Either way you heat these up, they make for a deliciously hearty breakfast. 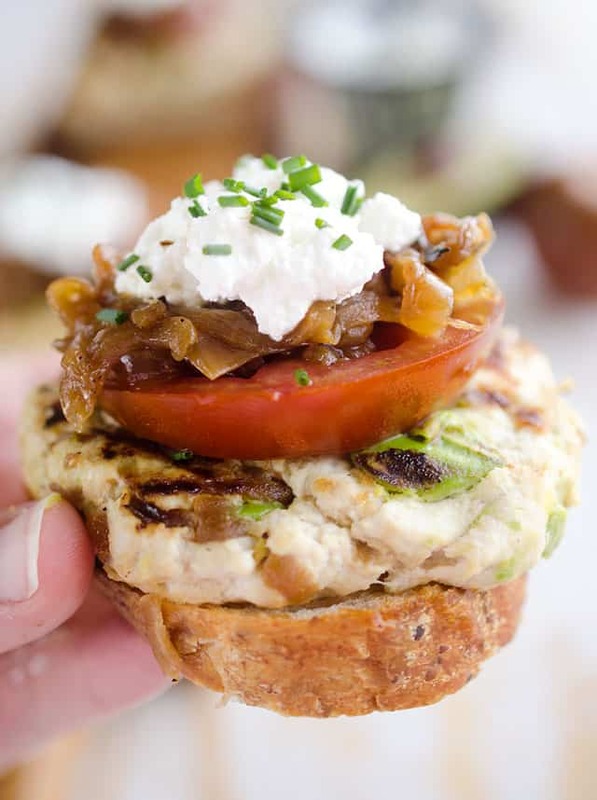 Making healthy substitutions to your normal recipes is one of the easiest ways to eat a little healthier while still keeping all of the great flavors of a dish. 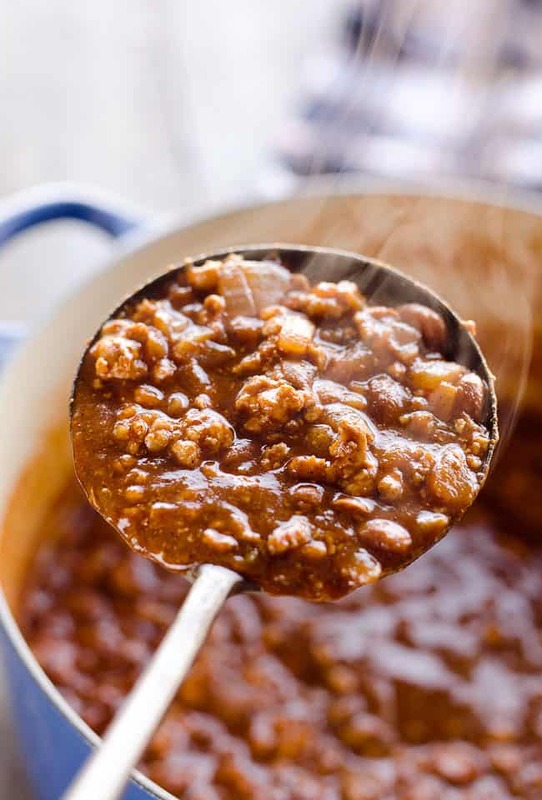 For example, swapping out otherwise fatty ingredients like sausage with leaner turkey sausage from Jennie-O or subbing in Greek yogurt instead of sour cream can lighten a dish without sacrificing flavor. These simple swaps can go a long ways in cutting fat and calories but keeping your meals delicious! 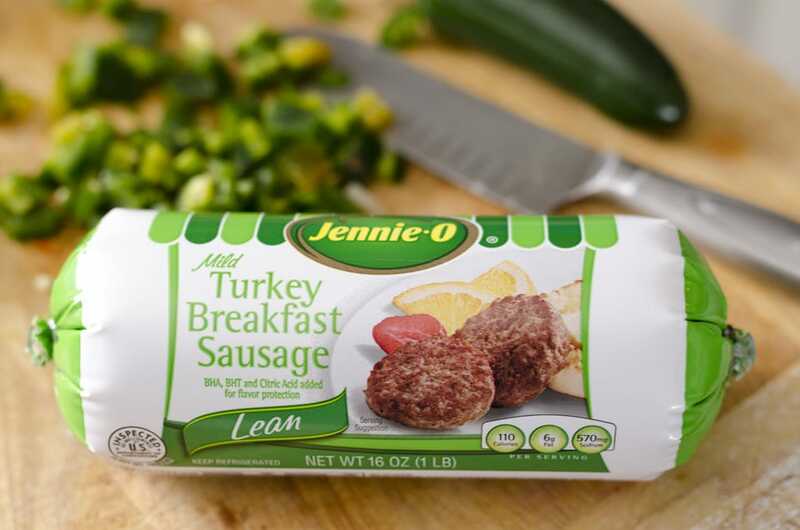 Grab a coupon for $0.55 off any Jennie-O breakfast products for a limited time! Arrange the sweet potato, onion and bell pepper on a lined baking sheet. Toss wtih olive oil, salt and chipotle powder. Bake at 400° for 35 min, tossing once half way through. In a large non-stick skillet over medium-high heat, cook the jalapeño for 1 minute. Add the sausage and cook for an additional 5-7 minutes until cooked through and crumbled. Set aside and let cool. Meanwhile in a separate non-stick skillet, cook the eggs, milk and a dash of salt and pepper over low heat, stirring constantly until the eggs are light and fluffy. Remove from the heat and set aside. 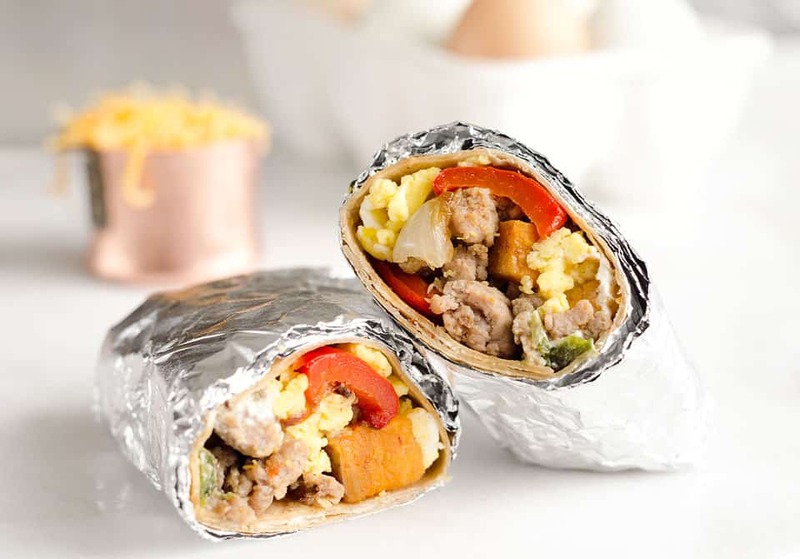 To assemble the burritos, top each tortilla with 1/4 c. eggs, 1/4 c. veggies, a scant 1/4 c. turkey sausage and 1/2 oz of your favorite cheese. Tuck the edges of the tortilla towards the center and roll into a burrito. OPTIONAL - Add a smear of Greek yogurt on the end flap of the burrito so it stays securely closed. Enjoy immediately or roll in a piece of tinfoil and package in an airtight container. Store frozen for up to 2 months. REHEATING - Unwrap a burrito and heat it in a skillet over medium heat for 2-3 minutes on each side -OR- bake it in the oven in the tinfoil for 15-20 minutes. I need to stock my freezer STAT! These look like a delicious breakfast option! I plan on making these this week, but I’m wondering how they do being heated up in the microwave? I’m a terrible morning person, but I want to start eating good, healthy breakfasts. I’m hoping to make these, wrap them and take it to work with me and heat it up when I get there. What are your thoughts? These are perfect for just that purpose! It will depend on how long they have thawed out of the freezer and your particular microwave for how long to heat them, but I would start with two minutes and go from there. This looks like a delicious breakfast option! I am so excited to make this! Question tho any nutritional info? I’ve started a food log and have been keeping track of what I eat and just was curious about the calories etc. I hope you enjoy it Lucy! I added the nutritional information below the recipe.